Bathing Wipe, Standard Weight, Fragrance Free. Designed to provide comfort and relaxation for individuals suffering from respiratory problems, leg, ankle or foot discomfort. 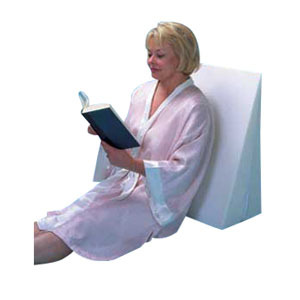 Can also be used to support your back while sitting upright in the bed, Comes with a removable, zippered, machine-washable cover with additional replacement covers available. Gentle support when necessary to elevate the upper body or leg. Can be used as a trunk stabilizer for side-lying position. Helps alleviate breathing problems, poor circulation, hiatal hernia, back or neck problem. Polyurethane foam slant with removable zippered blue poly/cotton cover.